Oops - we don't appear to have a video for the ScanSnap S500. We have found this to be a really useful low volume scanner for a paperless office. The best feature for us is the ease with which you can file and rename documents as you scan. The ability to scan A4 documents is also useful. Easy to set up and easy to use, no complaints or problems with any of the 7 scanners we now have in our offices. We are absolutely delighted with the Fujitsu ScanSnap S500, it is a major time saving device for a very busy and demanding environment. It is a great shame advances of this magnitude have not extended to other interfaces of the network. The scanner is excellent, its really quick and with such a small footprint its ideal for the office. Its simple to install and I like the way it can scan several sheets at a time, one after the other- unlike a flatbed scanner. I would recoomend it to anyone and the service from Trade scanners was first class too. Highly recommended. 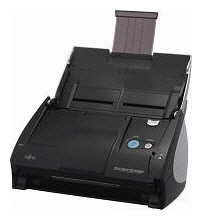 The Fujitsu ScanSnap S500 is very good , Ideal for document scanning , user friendly software . The service supplied was excellent , next day delivery and 5* sales information on the best product for the job..
As a small business user, we tend to purchase a lot of our hardware items directly off the web, I have to say I have been pleasantly surprised with the level of customer service I have received from yourselves since my Scan Snap scanner purchase. Firstly it arrived next day, exactly as ordered/promised – no hassle, secondly following receipt I have had a couple of emails advising of additional services which has only enhanced the purchase. The Scan Snap is an excellent scanner. Mulitple pages are scanned very efficiently – both sides. The devise was easy to set up and install. Overall I am very pleased with the purchase. The service was excellent. Very fast delivery and to the right place. Great product and software (Fujitsu ScanSnap S500). We have used the ScanSnap S500 now on 4 occasions and have found it to be the best value for price in the market place, our customers love it and one has purchased 3 now. Its fast and very simple to setup and use. A great little scanner - folds away great - but powerful enough to meet all my scanning needs. Would recommend it for medium range job, reliable product. The included "ScanSnap Organizer" automatically converts scanned data into searchable PDF files, while the Fujitsu ScanSnap S500 High Speed Document Scanner's image enhancement technology increases character recognition for more precise OCR accuracy. The bundled ABBYY FineReader enables the user to scan documents directly to applications such as Word, Excel and PowerPoint. Scan business cards directly to your contacts database with the included CardMinder application. CardMinder captures information written in 7 languages from scanned business card images and stores this information in an easily accessible format. Simple installation and operation in a compact design! The ScanSnap S500 easily installs via its USB 2.0 interface and its small footprint requires less space than a letter size piece of paper. Note: The Fujitsu ScanSnap S500 High Speed Document Scanner device driver does not support the TWAIN or ISIS protocol. Scanned images cannot be acquired directly from a TWAIN or ISIS application.